Dale has a podcast channel on the Be Here Now Network. Some of the podcasts are talks by Dale and some are interviews with friends such as Ram Dass, Annie Lamott and Robert Thurman. Go here. 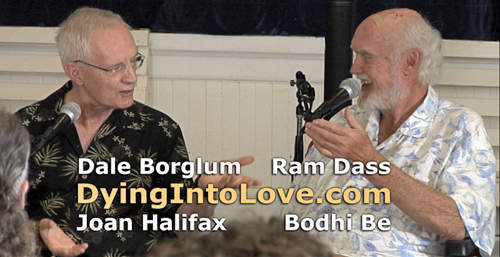 Ram Dass, Dale Borglum and Bodhi Be facilitated a one-day workshop on Maui entitled Living an Awakened Life in April 2012. A video of this workshop as well as videos of two workshops that Ram Dass, Joan Halifax and Bodhi Be facilitated on the topic of conscious dying are available at dyingintolove.com. Dale’s interview with Buddha at the Gas Pump. The Art of Conscious Living, Television Interview, January 22, 2016. A Forum for Spirituality recorded a television interview with Dale Borglum on September 8, 2012. Archives of this interview can be found here.